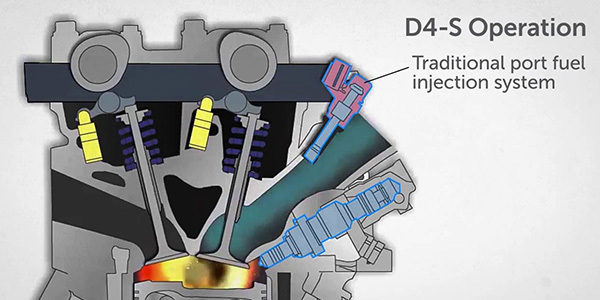 Gasoline Direct Injection engines go by many names including GDI, DI, FSI and more. Car manufacturers have introduced this engine technology in response to federal emissions and fuel mileage requirements. While these engines offer a lot of upsides as far as fuel economy, horsepower, lower displacement and fewer tailpipe emissions, they also have some downsides. Despite the negatives, GDI has been adopted by more and more OEMs over the years and represents roughly 45% of the market for cars. Carbon buildup is the biggest issue for these engines and can lead to many more problems for the owners of these vehicles. The carbon buildup occurs in the intake valves and, over time, reduces the airflow to the cylinders, which eventually leads to reduced power. Small particles of dirt from intake air and blowback carbon from the crankcase ventilation system can deposit onto the walls of the intake because fuel isn’t sprayed on the back of the valves like in a port-injected setup. The buildup can become significant enough that a piece of debris can break off and damage catalytic converters. It can also cause intermittent ignition problems. The OEMs have known about this issue for a while, and aftermarket companies have been working on solutions, but there’s no magic bullet yet. One of the issues is that the type of fuel available today is not all the same. Some lower-quality fuels don’t contain enough detergents to clean the valves and, therefore, are more susceptible to contamination. Top Tier fuels are recommended for use in direct-injected engines. These fuels are available from most major gas stations. But, using quality fuel alone will not keep the engine out of harm’s way. These engines require more frequent service intervals and the use of high-quality lubricants, as well as some other chemical treatments or even media blasting, to keep the fuel system in tip-top shape. Instead of the good, better, best motto that many shops are used to offering for products such as brakes and tires, direct injection service goes the opposite direction from good to bad to worse. A multifaceted approach is the best way to stay on top of the carbon buildup issue. First, the vehicle owner should always run Top Tier gasoline. This gasoline is blended with the necessary detergents that help clean the fuel system and keep the valves clean. These fuels are better refined with fewer contaminants that can vaporize into hardened deposits that can cause hot spots or bake onto the back of the intake valve like lava. Under certain conditions, small pieces of carbon can break off from the valves and drop into the combustion chamber and then stick to the cylinder walls. These bits can get doused with fuel and turn into hot coal that makes a hotspot and sets off a pre-ignition condition. This occurs because the intake valve is not getting hit with fuel and cleaned as it would in a port-injection engine. Usually, the valves are cooled by heat transfer from the valve seat, but when oil droplets come through the intake port and pass through the cylinder head, they’ll stick to the backside of the intake valve, getting thicker and thicker until there’s a CEL and a poor-running condition. Some products claim to clean the build up of gunk, but often the buildup is too much, and another solution is necessary, such as media blasting the intake ports. Customers need to be educated about the proper maintenance intervals and the risk of not changing oil and filters soon enough. With oil change intervals as high as 10,000 to 12,000 miles, there’s a significant risk that the detergents will break down before then. Another part of the problem surrounding the GDI engine is that no one is educating the consumer about the issues they have or ways to avoid them with things like proper oil maintenance and change intervals. With all of the complexities of today’s engines and the increasingly tight tolerances in which they are built, one of the worst things to do is to ignore maintenance intervals. Customers need to be educated about the proper intervals and the risk of not changing oil and filters soon enough. With oil change intervals as high as 10,000 to 12,000 miles, there’s a significant risk that the detergents will break down before then. Some vehicle manufacturers have begun to integrate components and systems to capture oil vapors and particulates, but no method is effective all of the time. And, the trend has been that more vehicle owners are being shocked by considerable repair costs as a result of these issues. Consumer Reports recently wrote an article about a reader who took his 2006 VW GLI with the 2.0T FSI direct-injection engine to a dealer to diagnose an engine code. He was shocked to find heavy carbon deposits were in the intake that resulted in driveability issues. When the manufacturer wouldn’t cover the cost to repair the problem, the owner took it to a local shop that cleaned the valves with walnut shell blast media for about $500 or so. This scenario is happening more and more with direct-injection engines because most customers don’t know they have this type of engine, or that they need extra maintenance. If you haven’t seen many carbon buildup problems on direct-injection engines yet, chances are you will soon. These engines are quickly becoming the go-to-engine of choice automakers for their ability to increase fuel mileage and lower emissions. But, the carbon buildup issue is not as big of a deal to the OEMs as meeting the demands for efficiency and lowering emissions. However, some are starting to get the message from angry consumers. Toyota and others have added an injector to clean the back of the intake valves. While this solution negates some of the fuel economy gains, the resulting benefit is valves that won’t gunk up down the road and make unhappy customers.